Mecklenburg-Western Pomerania (Mecklenburg-Vorpommern in German) forms the country’s Northeastern corner, sharing its Eastern border with Poland. It is Germany’s least populated state, counting only 80 inhabitants per square kilometer, as opposed to over 230 for the national average. With over 2,000 lakes, almost 2,000 km of coastline, and with its rivers and freshwater lagoons, Mecklenburg-Western Pomerania is a water-lover’s paradise. Water makes up ten percent of the state’s territory and it boasts of an incredible 24,000 km in water ways, making it a prime destination for water sports. The state is home to Germany’s largest lake, Lake Müritz, and to the popular tourist destination Rügen, the country’s largest island. 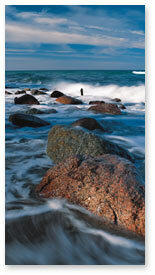 The state’s Baltic coastline with its beautiful bays and beaches attracts massive numbers of tourists each summer. The city of Schwerin is the capital of Mecklenburg-Western Pomerania but the Hanseatic towns along the coast, prime among them the city of Rostock, have historically provided economic prosperity to the region. For a long period (1648-1815), parts of the region belonged to Sweden politically and trade with Scandinavia flourished. Mecklenburg-Western Pomerania’s most invaluable resource is its vast stretches of pristine nature. The region’s serene landscapes convey a sense of natural tranquility and peace. In order to preserve this treasure, roughly one fifth of the state has been turned into nature conservation areas. Little wonder that the state attracts tourists, particularly water sports enthusiasts and spa tourists seeking rest and relaxation in the state’s famous resort towns. 2018 will mark the 130th anniversary of the German “beach basket”, an icon of Germany’s leisure and vacation culture. The prototype of the “beach basket” was invented in 1882 by a basket weaver near the resort town Warnemünde, as a custom order for a spa tourist who was suffering from rheumatoid arthritis but still wanted to enjoy the beauty of the Baltic beaches. Other beachgoers envied the comfortable invention and only a year later, the basket maker had come up with a two-person model of the beach chair. Today, this accidental invention enjoys great popularity among vacationers and has become an integral part of the German beach landscape. The German government increased the iconic value of this beach lounger in 2007 on the occasion of the G8 Summit held in Heiligendamm, one of Mecklenburg-Western Pomerania’s famous beach resorts. A custom-made XXL beach basket served as a unique backdrop for the summit’s official group picture (photo courtesy of the Federal Press Agency). In addition to tourism, centered along the Baltic coast, Mecklenburg-Western Pomerania’s other main industries are shipbuilding and agriculture. With 3700 acres of fertile land, Mecklenburg-Western Pomerania has more than 4000 farmers. The most popular crops are grain, potatoes, and root vegetables. In early summer brilliant yellow fields of rapeseed dot the landscape. Traditional dishes from Germany’s Northeast have a distinct character which they owe to the state’s landscape and its natural resources. The regional cuisine offers an astounding variety of fish and seafood dishes as well as hearty and nutritious cooking using local crops which grow plentifully in the fertile soil. The names of certain dishes in Germany’s North may look and sound strange even to a native speaker of German since traditional dishes often are known by their name in Platt, the dialect of the country’s Northernmost states, including the Hanseatic city states Bremen and Hamburg. Mecklenburg-Western Pomerania’s young generation of chefs has successfully taken local cuisine into a more modern direction which makes it more compatible with today’s lifestyle and its challenges. The coastal waters of Mecklenburg-Western Pomerania provide a unique habitat and are particularly rich in fish. The irregular shape of the Baltic coastline creates innumerable small bays almost completely enclosed by land. The local word for these typical inlets is Bodden, a term which can be found in many of the regional seafood species and the dishes they are used in (e.g. Boddenbarsch, a type of perch found in Baltic coastal waters). The narrow openings of these inlets keeps the water’s salt content very low, so low in fact that freshwater fish can thrive in this special habitat. Fish caught in these Baltic bays are especially tender and flavorful. The riches of the Baltic Sea have been severely reduced over-fishing but still provide employment to both deep sea and coastal fishermen. The catch is diverse with over 100 fish species, including cod, the staple fish of the Baltic Sea, herring, flounder and many others. Herring has always played a major role in the state’s history. This was especially true during the second half of the 18th century when herring was particularly abundant along the Baltic Coast and became known as the common man’s food. In recent decades, however, stocks of herring have decreased dramatically due to strong demand. 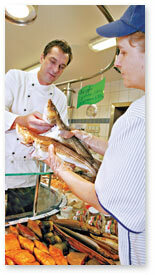 With a market share of around 25 percent, Herring is still by far the most popular fish among German consumers. The Baltic islands with their seemingly endless miles of coastline and fertile land have always provided plentiful sustenance to local fishermen and farmers. The most traditional dishes from the islands are straightforward and don’t require very much in terms of preparation. Naturally, the islands’ cooking abounds with fish and seafood dishes like broiled cod or eel soup. Agriculture has always been essential to the well-being of both the people and the economy of Mecklenburg-Western Pomerania. A wide variety of grains, potatoes, cabbage and root vegetables thrive on the region’s fertile land. One of the most popular traditional ways of preparing local crops is by throwing them together in one pot. Mangkokt-Äten, as it is known in the local dialect, is a meat and vegetable one-pot dish which usually consists of cabbage, carrots, turnips, often peas and usually pork. This hearty dish provided perfect nourishment to hardworking farmworkers. Once the potato had become the food of the common people, the urban middle class began serving potatoes, meat and vegetables separately. Some traditional desserts from the lands of Mecklenburg and Pomerania include rhubarb compote (in late spring), red fruit pudding (Rote Grütze) in the summer, served with milk or vanilla sauce, potato pancakes and freshly made apple sauce during the fall harvest season. For the winter months, fruit was preserved through bottling or drying processes. Two early and simple modes of preparation for cake can still be found today because they are quite easy to prepare: Plattenkauken (Blechkuchen in standard German) are sheet cakes baked in the oven, Pottkauken are cakes prepared in a pan on the stovetop. The most popular alcoholic drink in Germany’s Northern territories is the stimulating Schnaps. Formerly, many people made their own schnaps from potatoes. ‘Wines’ made from wild-growing elderflower and sloe bushes are also typical regional specialties which some people still like to make at home. Hard liquor is consumed in quantities which have caused concern among doctors and dieticians because the liquor consumption of people in Mecklenburg-Western Pomerania (short of 30 pints per year per person) exceed the national average (approximately 20 pints per year per person) considerably. One possible explanation of this drinking habit may be found in the region’s history. Under Prussian rule drinking and the resulting apathy among the populace seemed desirable to the ruling class. Thus they had distilleries built all across the lands (every thirty to sixty miles) which supplied neighborhood grocery stores, bars and restaurants with strong alcoholic beverages. People of Mecklenburg-Western Pomerania have a long tradition of celebrating seasonal local produce and fish. The earliest of these culinary celebrations are the herring weeks which are kicked off on the island of Rügen. They entail various rituals but above all the feast of freshly caught herring served in many different ways – freshly fried with or without batter, marinated, pickled or smoked. The island of Usedom also is famous for its herring week during which restaurants offer an astounding variety of herring-based dishes. At the end of these culinary weeks the “Golden Herring” is awarded for the most original dish. Next is the celebration of horn fish season (Rügener Hornfischtage) which falls around May. Horn fish have naturally green bones and are usually served with mashed potatoes and rhubarb stew. Again local chefs compete with each other to be crowned best horn fish restaurant. The most important crops also have food festivals dedicated to them which fall into harvest season. In September Usedom Island holds its popular “Tüftentagen” during which the potato rules supreme, whereas the island of Rügen holds cabbage weeks (Rügener Kohlwochen) in October. ics have started to take notice of this culinary evolution. Along with the culinary powerhouse of Dresden, Saxony’s capital, Mecklenburg-Western Pomerania is the up and coming force to be reckoned with in Germany’s East. The most important culinary guides for Germany, Michelin, Gault Milau, Varta, Aral-Schlemmer-Atlas and Feinschmecker, have recommended an impressive 150 restaurants in Mecklenburg-Western Pomerania.